Last night I delved into Chinese cooking experimentation (while Mrs. Chang’s advice is still fresh in my mind). First up – scallion pancakes! 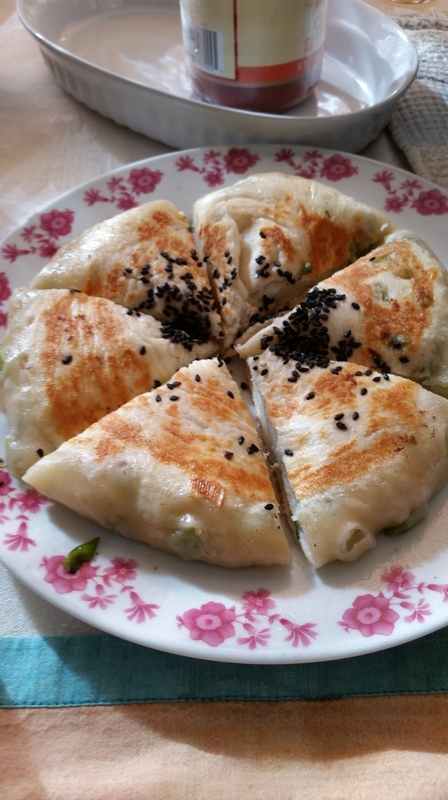 True confession: I did not discover scallion pancakes until I went to Gourmet Dumpling House in Boston’s Chinatown last January. My boyfriend took me there on a date and ordered them for us. I sat there quite confused, imagining your typical Hungry Jack breakfast pancake with scallions. When the waiter brought the pancakes to our table, my eyes widened in surprise. With one bite you are immediately hit with fresh scallions warmed to perfection within the dough. I sometimes lose the flavor of scallions when I sauté them too much, and sometimes too many fresh scallions in a salad can make them too pungent. Scallions were just made to be put into a pancake like this (in my humble opinion). And the pancake magically has these doughy layers reminiscent of flaky biscuits, though it’s not exactly the same thing. Wondrous! I know. It’s tragic how long I went without them. 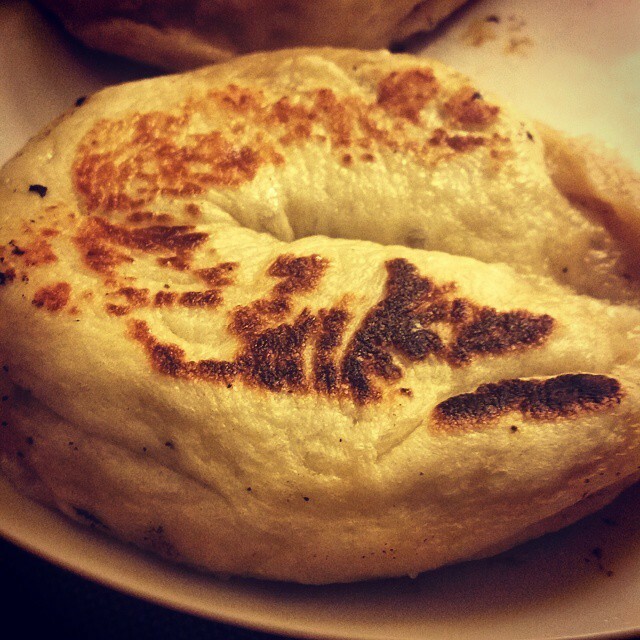 So, if you have never had the immense pleasure of eating scallion pancakes, never fear! A recipe is here. To remind you from my previous post, here is the picture of Mrs. Chang’s scallion pancake. 1. Thaw frozen bread dough according to the package’s instructions. 2. Cut the bread dough into thirds. One loaf of bread dough makes about three good sized pancakes. 3. On a wooden board or cutting board, roll out the first piece of dough until it resembles a round pancake, about one-quarter to one-half inch thick. It will help if you flour the surface on which you are rolling and flour the bread dough itself so that nothing sticks! 4. Sprinkle salt, pepper, and sesame oil (about the size of a nickel will do) on the pancake’s surface. Spread that sesame oil around so it covers the entire pancake. 5. Take your chopped scallions and sprinkle them on top as well. You can add as much or as little as you’d like. In my opinion, the more the better! 6. Now, roll up the pancake long ways as if you were making cinnamon buns. It should look like a thin log at this step. 7. Take both ends of the rolled up pancake and join them together to make a circle. The pancake is now going to look like a bagel without the large hole in the middle. The dough is going to want to separate here and be that log again, but you want it to be a pancake! With your fingers, smoosh the separated parts of the dough together so that the pancake stays round with no gaping holes. 8. If you want to add sesame seeds to the pancake, you will sprinkle them on top of the pancake at this point. Then, take your rolling pin and roll the pancake out again so that it’s about one-half inch thick. 9. Repeat the previous steps for the next two pancakes. 10. Put some olive oil (or the oil of your choice – canola, coconut, etc.) in the pan and turn the heat on high. Place the scallion pancakes in the pan. 11. Add water to the pan so that the pancakes are submerged about halfway. 12. Cover the pan and let the pancakes cook until the boiling water evaporates. Then turn down the heat to medium-low so that the pancakes have a chance to brown on both sides. Watch them carefully here! Once the pancakes are browned, they are ready to eat. 1. I would turn the heat down a little bit before the water evaporates (around 1-2 minutes before, perhaps). I had a few pancakes start to brown before all the water evaporated, making some of the bottoms burn too much for my liking. 2. Adding sesame seeds to the dough adds another level of flavor that I’d like to try next time. This recipe is still tasty without them, though! Stay tuned for my next experiment in Chinese cooking: steamed pork buns!